Every body is different. But who among us hasn’t experienced some stomach upset, heartburn, indigestion, or irregularity? In some cases, a home remedy like baking soda in water to tamp down acid or a spoonful of apple cider vinegar to boost it before a meal can help. But, at some point, each of us has to make a decision about what might do more. 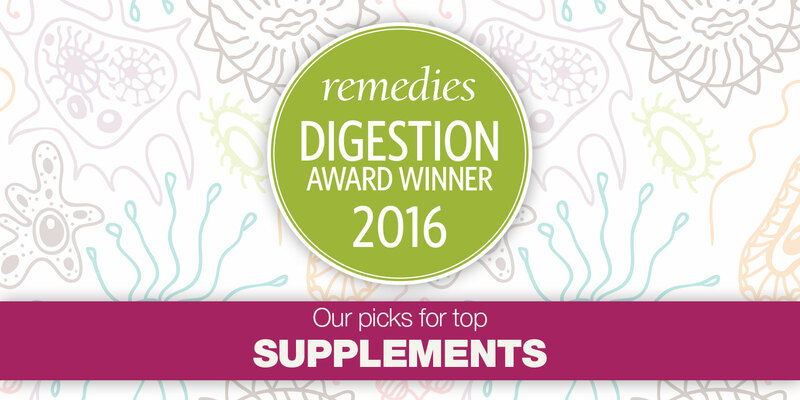 Enter the latest and greatest natural products that aim to help with one-time distress or long-time digestive disability. Here’s a sampling of what’s most likely to get you back to the dinner table in top form. Unique combination features nine plant-based enzymes, fiber, and probiotics. Dr. King’s aquaflora Probiotic Restoration contains 19 homeopathic ingredients to fight a wide variety of digestive ills. Comes in an easy-to-use spray pump. GoodBelly Probiotics & Protein with 15 grams of protein is a tasty way to get vegan protein along with 40 billion probiotics. We like the Tropical Coconut flavor. Just Thrive Probiotic & Antioxidant is intended to recondition the gut, rather than “reseed” it with healthy bacteria. Contains spore-based strains of bacillus medically prescribed in Europe and Asia. Naturade Symbiotics Colostrum Plus Nutrient-rich “first milk” from cows is believed to support healthy gastrointestinal flora as well as the immune system. Fool your taste buds with Solgar ohso chocolate. Each 70-calorie bar contains about a billion probiotic bacteria, which may be more likely to live until they reach the small intestine than they may in dairy products. Enzymedica Digest Gold was a successful introduction to digestive enzymes for one remedies staffer. Contains multiple strains of enzymes that work at different pH levels. NOW Super Enzymes A variety of enzymes to help digest proteins, fats, and carbohydrates, plus ox bile extract and pepsin to further aid digestion. Renew Life Formulas Extra Care Digest Smart Plant-Based Enzyme High-Potency formula is delivered in a protective capsule that resists stomach acid. It also contains soothing ginger. FloraLax from Flora is an easy-to-take mixture of organic flax seeds, organic psyllium husks, and organic oat bran. A gentle addition of fiber to the diet. Garden of Life RAW Fiber is derived from a number of organic sprouted seeds, grains, and legumes, and contains omega-3 fatty acids from flax and chia seeds. Garden of Life Dr. Formulated Probiotics Once Daily Ultra 90 Billion offers 15 strains of bacteria in a high-potency and dairy-, gluten-, soy-, and wheat-free formula. MegaFood MegaFlora Plus offers 50 billion active colony-forming units (CFU) of 14 strains found naturally in the human intestine. Recommended for use after travel or antibiotic use. NOW Foods Probiotic-10 100 Billion is a super high-potency probiotic with 10 strains of bacteria that’s free of dairy, soy,and gluten. Wakunaga of America Probiata Critical Care contains 50 billion CFUs of Lactobacillus plantarum, a bacterium touted in over 75 studies to target digestive problems.